Last Wednesday the Abbey Theatre announced Waking The Nation, their 2016 season and there were immediately comments being made online about the total lack of gender balance. Only one of the ten playwrights featured is female, and there’s only three female directors. Four days later, the conversation is still continuing on Facebook and Twitter which I think is fantastic. This is not going to go away any time soon. Lian Bell did a sterling job of collecting responses from the theatre community last night (Oct 31) – have a look at her twitter stream here or follow the #WakingTheFeminists tag. I do plan on writing about it, it’s just taking me a little while to get my thoughts in order. This is a placemarker post with some suggested action! It’s one of things that came up in conversations online – instead of just talking about this injustice, what can we do to make it better? Tanya Dean‘s suggestion was to put your money where your mouth is and see more work by women. This is really easy to do because, despite what the Abbey programming might suggest, there are lots of women making great theatre in Ireland right now. As I said in my last post about Feminist Film Festival, I think it’s important to support female artists and because it’s the first of the month, I thought I’d do a short list of work by women on this November. Foxy, written by Noelle Brown and directed by Oonagh Murphy. The Bells Of, written by Barry McEvoy and directed by Louisa Sanfey. It is a very Dublin centric list, though How to Keep an Alien and Separated at Birth are both on tour throughout the country. (Links above will bring you to full list of tour dates.) Please let me know if there’s anything you think should be included. 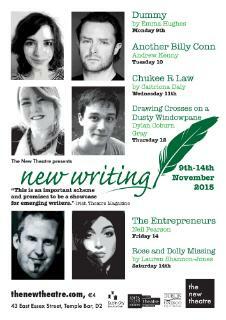 Finally, there’s an opportunity to see new writing by men and women during the New Writers Week at the New Theatre, 9 – 14 November. You can enjoy a new play every night at 7.30pm, Monday – Saturday. Three new plays by men and three by women – fancy that!